Cystatins are small, phylogenetically conserved proteins that are tight-binding inhibitors of cysteine proteinases. The liver fluke Fasciola hepatica uses a diverse set of cysteine proteinases of the papain superfamily for host invasion, immune evasion and nutrition, but little is known about the regulation of these enzymes. The aim of this work is to characterize the cystatin repertoire of F. hepatica. For this purpose, we first surveyed the available sequence databases, identifying three different F. hepatica single-domain cystatins. In agreement with the in silico predictions, at least three small proteins with cysteine proteinase binding activity were identified. Phylogenetic analyses showed that the three cystatins (named FhStf-1, -2 and -3) are members of the I25A subfamily (stefins). Whereas FhStf-1 grouped with classical stefins, FhStf-2 and 3 fell in a divergent stefin subgroup unusually featuring signal peptides. Recombinant rFhStf-1, -2 and -3 had potent inhibitory activity against F. hepatica cathepsin L cysteine proteinases but differed in their capacity to inhibit mammalian cathepsin B, L and C. FhStf-1 was localized in the F. hepatica reproductive organs (testes and ovary), and at the surface lamella of the adult gut, where it may regulate cysteine proteinases related with reproduction and digestion, respectively. FhStf-1 was also detected among F. hepatica excretion–secretion (E/S) products of adult flukes. This suggests that it is secreted by non-classical secretory pathway and that it may interact with host lysosomal cysteine proteinases. 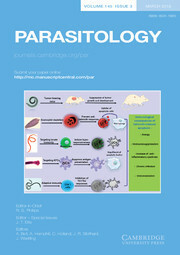 Cancela, Martín, “Functional characterization of single-domain cystatin-like cysteine proteinase inhibitors expressed by the trematode Fasciola hepatica,” RIQUIM - Repositorio Institucional de la Facultad de Química - UdelaR, accessed April 22, 2019, http://riquim.fq.edu.uy/items/show/4916.